Reading a post on Boingboing pointing out that God is a registered trademark, I was reminded of one of those little bits of information I assimilated along the way, but that was usually of little significance. Namely, that “Let There Be Light” is a registered trademark of Business Objects, which is owned by SAP. © 2008 Business Objects, an SAP company. All rights reserved. Please refer to the user guide for a list of Business Objects’ patents. Business Objects and its logos, Business Objects, business Process On Demand, BusinessQuery, Crystal Applications, Crystal Enterprise, Crystal Reports, Crystal Vision, Desktop Intelligence, Inxight and its logos, Star Tree, Table Lens, ThingFinder, Timewall, Let There Be Light, Metify, NSite, Rapid Marts, RapidMarts, Voyager, Web Intelligence, and Xcelsius are trademarks or registered trademarks in the United States and/or other countries of Business Objects and/or affiliated companies. SAP is the trademark or registered trademark of SAP AG in Germany and in several other countries. All other names mentioned herein may be trademarks of their respective owners. So if you didn’t have a good enough reason not to use god®’s name in vein, now you do. 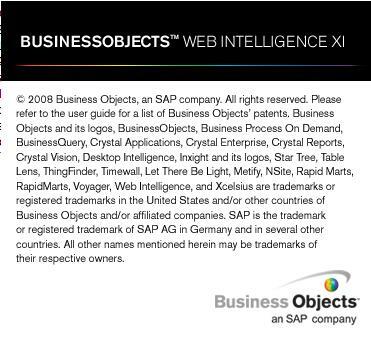 Be the first to comment on "Let There Be Light is a registered trademark of SAP’s Business Objects."